Burger Fuel leads the pack in our inaugural Quick Service Restaurants ratings. Burger Fuel secured five stars for overall satisfaction, the taste of its food, quality of ingredients, variety of food choices and customer service. 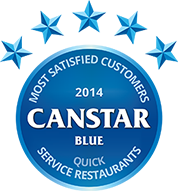 Close to a quarter of the New Zealanders who responded to our Canstar Blue recent survey told us they eat takeaway from a fast food outlet more than once a week. This number rocketed to 30% when we asked Aucklanders the same question, but dropped to 17% and 16% when residents from Wellington and Otago were asked. That’s a lot of hungry New Zealanders getting a fast fix! Nearly three in five find the food they get from these restaurants to be “tasty and fresh”, but which chain is most popular with customers? We endeavoured to find out. Each brand offers something unique to customers, so let’s take a look at each one in turn. What makes it stand out? Its selection of gourmet burgers and its “hot rod” attitude. Did you know that Burger Fuel has drive-through ordering in its Dubai outlet? Or that it sponsors various car racing events across the country? This restaurant chain is nothing if not surprising and has done exceptionally well in these results. Burger Fuel secured five stars for overall satisfaction, the taste of its food, quality of ingredients, variety of food choices and customer service. The company also received four-star ratings for value for money, its variety of healthy options on the menu and speed of food preparation. What makes it stand out? Fresh sandwiches and wraps made to order. Subway performs well in our Australian results every year, so it’s little wonder the brand has excelled in many areas of this New Zealand survey. Subway was close behind our award-winner, receiving five stars for value for money, variety of healthy menu options and for the speed of its food preparation. Subway also finished with four stars for overall satisfaction, food taste, ingredient quality, variety of food choices and customer service. What makes it stand out? The distinct flavour of its butterfly-cut, Peri-Peri Chicken… and its super-hot sauce. Nando’s consistently performed well in these latest results. The brand received four stars for overall satisfaction, value for money, food taste, quality of ingredients, variety of healthy options, speed of food preparation and customer service. Three stars were achieved for its variety of food choices. What makes it stand out? Authentic American hamburgers. If you want the taste of the US at home, then Carl’s Jr. – complete with “Philly cheesesteak” burgers and choc chip cookie ice cream sandwiches – is the way to go. Carl’s Jr. achieved five stars for value for money and four stars for overall satisfaction, taste of food, quality of ingredients, variety of food choices, speed of food preparation and customer service. It also received three stars for the variety of healthy options available on its menus. What makes it stand out? Square beef patties, made fresh – not frozen. Wendy’s has some great gourmet items available (at time of print), such as portabella mushrooms on brioche buns, with either beef or chicken fillings. It’s just one way the company is separating itself from the crowd. Wendy’s received four-star ratings for variety of food options and the speed in which the food is prepared. In all other areas – overall satisfaction, value for money, food taste, quality of ingredients, variety of healthy options and customer service – it received three stars. What makes it stand out? Big burgers made with fresh ingredients. This chain is all about “big flavours” according to its mission statement. Burger King earned four stars for value for money; three stars for overall satisfaction, taste of food, quality of ingredients, variety of food choices, speed of food preparation and customer service; and two stars for its variety of healthy eating options. What makes it stand out? Happy Meals, playgrounds and a well-established menu. This brand needs no introduction: many of its well-known burger meals have been staples for years… even decades. In short, McDonald’s delivers an experience that customers keep coming back for. McDonald’s received three-star ratings for overall satisfaction, value for money, quality of ingredients, variety of food choices, speed of food preparation and customer service. It achieved two stars for its variety of healthy options. What makes it stand out? Chicken coated in the secret 11 herbs and spices, the full recipe for which is held under some fairly exhaustive security. KFC finished these results with three stars for overall satisfaction, value for money, quality of ingredients, variety of food choices, speed of food preparation and customer service; as well as two stars for variety of healthy options. Canstar Blue commissions Colmar Brunton using the SSI panel to regularly survey 2,500 New Zealand consumers across a range of categories to measure and track customer satisfaction. The outcomes reported are the results from customers within the survey group who have purchased and consumed food from a quick serve or fast food restaurant, excluding pizza, in the last month – in this case, 367 New Zealanders.